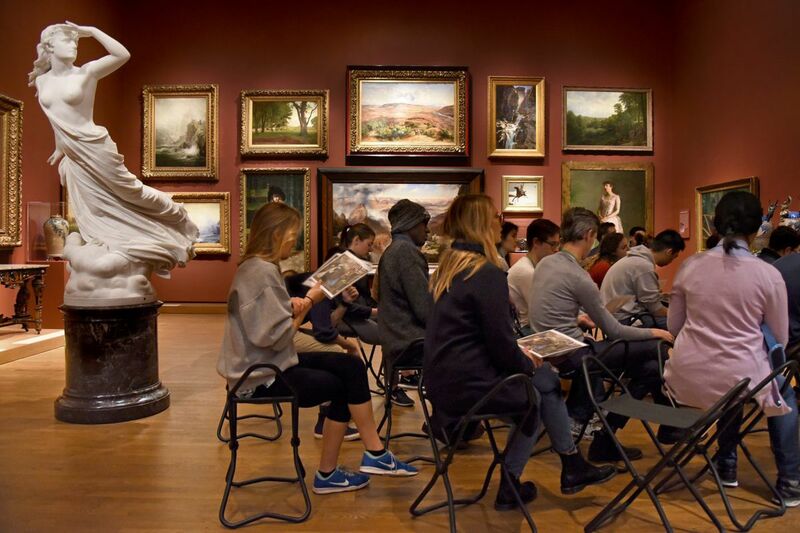 First-year Penn medical students sharpen their observation skills at the Philadelphia Museum of Art, overseen by a marble sculpture, “The Lost Pleiad,” by Randolph Rogers. In a hushed gallery on the second floor of the Philadelphia Museum of Art, 24 first-year Penn Medical students crouch on low stools, contemplating two depictions of the Annunciation, trying to read Mary's emotions in each painting. The elective course, offered this term for the fourth year, is designed to improve students' observational skills. Learning to see is fundamental to becoming a good artist. Lately, a number of medical schools, concerned about their students' poor clinical observational skills, have turned to art for help. Students observe the painting, “The Annunciation” by Henry Ossawa Tanner. At right is “The Agnew Clinic,” by Thomas Eakins, which shows medical students at Penn observing surgery. A new study from the University of Pennsylvania and Children's Hospital of Philadelphia (CHOP), in collaboration with the art museum, shows that such courses significantly improved students' observation skills and showed that art training – without a clinical component – could help teach medical students to become better clinical observers. Thirty-six students who took six, 1.5-hour art observation course at the art museum were measured against a control group who received no such training. In a post-study questionnaire, students who received the art training said they felt more empathetic, and indicated that they had already begun to apply the skills learned in the course in clinically meaningful ways as first-year medical students. "It teaches you to learn to see and to utilize what you see," said Jaclyn Gurwin, ophthalmology resident at Scheie Eye Institute and lead author of the study. Gurwin, who had art training before medical school, finds that "all specialties benefit, from ophthalmology to doing a physical exam. Even in psychology, you can better read body language and facial expressions to figure out emotional states." The classes for first-year medical students at the Philadelphia Museum of Art start with instructions on line, color, shape and other concepts to improve their descriptive, observational and communication skills. Later sessions focus on encouraging empathy by seeing works of art from varying perspectives. At the end of each class, a fourth-year medical student leads the group in reflecting on how the day's curriculum applies to clinical practice. The course also employs "artful thinking": specific routines that encourage creative questioning, reasoning and perspectives. Designed as simple exercises, they reinforce concepts – like looking at things from multiple vantage points – until they become habits of mind. Results of the Penn/CHOP study showed that students who followed this approach exhibited significant improvement in their observational skills, compared to a control group. "This is not an art history course," said Suzannah Niepold, manager of teacher services at the museum who co-teaches the class. "We teach looking techniques and essential skills that students can directly apply to clinical practice. We want them to be comfortable with observation, seeing things from multiple perspectives, description, evidence-based observation and communication." Co-teacher, Adam Rizzo, a museum educator, added: "We want to teach people to be aware of things like confirmation bias, when they jump to conclusions or too quickly interpret. We want people to learn to observe before they start to interpret so once they start to interpret they have a much richer and more complete understanding of what they're looking at." First-year Penn medical student Beatrice Go, 22, of Naperville, Ill.
Rizzo noted that the average time a museum viewer spends with a single artwork is 17 seconds, while the average time a doctor listens to a patient while taking a history is about 18 seconds. During the course, students are introduced to two pieces of art during a 1.5-hour session, so a "big part of our job here is getting them to slow down." "We've had interesting conversations about how in the hospital context they won't have the luxury of that amount of time," said Rizzo. "So we talk about how you transfer these skills to a hospital setting in a realistic way." Beatrice Go, 22, a first-year medical student, said the course already had an effect. "Although I haven't been in the clinic much yet, on my chances to intersect with patients I tell myself to slow down and listen to a patient first rather than jump to conclusions," she said. "It's also interesting to see how there isn't one concrete answer to seeing something…that we learn through multiple interpretations and seeing things in different ways," said Go. Penn medical student Sarah Frankl, 23, of Eagle River, Alaska. For first-year student Sarah Frankl, 23, the course is a "good thing to add to a medical school education. But it won't change the amount of time we have to write in the charts," she said, reflecting a common frustration with the paperwork involved in medicine. "But I do feel it forces you to communicate and articulate what you're thinking and why," said Frankl, "and what evidence you have for what you're thinking." Diego Dasilva, 26, a fourth-year medical student at Penn, acts as the coordinator for this semester's group. As a first-year, the course, "forced me to use a different part of my brain and step away from the science," he said. For Dasilva, seeing things from multiple perspectives is important. "For example – some patients don't want to have certain procedures done or take certain medications," he said. "But maybe they had a family member who had been adversely affected or read an article that may have been untrue. Or just have misconceptions." "If you put yourself in their shoes you can address their problems," he said. "This course teaches you to do that."